You wake up at 7 am on a Saturday, jump into your clothes and head to the back door to take your dog for a walk. You slip the collar and leash on and your dog turns into an unmovable cement block. No way is she going for a walk today, tomorrow or any day. There could be a few possibilities why your dog refuses to walk. Once we figure out why it happens, we can figure out how to fix it! Is your dog bored of the walk? Has she developed a lazy attitude and couldn’t be bothered or is the walk too structured? Is your dog overweight and walking is just a very hard task for her? Is there something on the walk causing your dog to experience anxiety such as a noisy machine or another mean dog or threatening human? Could your dog be experiencing a source of pain for them along the walk such as it being too hot, too cold, stones or salt hurting the pads of their paws? Is their tail going down between their legs and staying there? Is your dog ill or could they possibly be experiencing arthritis or joint pain? Is your dog playing you to get attention such as “not walking will cause my handler to talk and pet me to coax me?” This can happen even you struggle with your dog not coming inside at home. Does your dog’s gear fit properly and feel comfortable? Has your dog been trained to follow your expectations for a walk? There could be one or multiple reasons for your dog not wanting to get out for a walk. It’s important for you to be able to identify these things so that you can form a plan to remove them being in the way of your walk. Let’s take a look at each reason and explore some solutions. If your dog is bored of the walk and couldn’t be bothered, it’s your job to increase the entertainment factor! Try taking a different route where the smells and sounds of the new location will give your dog something to do while they are walking. You can also try bringing along some treats and stop at random spots to engage in some training. Making your dog work and rewarding it with food is often an exciting event for them. If your dog is overweight and walking is just a hard task requiring a great deal of effort then you may need to adjust their daily food intake in order to take a few pounds off. Consider daily treats as part of their food and reduce those as well. Once your dog lightens up a little walking might not be so difficult and then the walking will help them slim down further. Some dogs are simply nervous dogs. If there is a barking dog along your route or perhaps a noisy garage they may not understand that they are safe along that section and want to avoid it at all costs. Change up your route and look into building confidence in your dog so they understand they are safe. Be sure the surface you are walking on is not too hot for your dog. Some black top pavement can reach very high temperatures during the mid day summer sun if it is not shaded. In contrast to that, smaller dogs will have a more difficult time enduring the cold weather for long periods. They could also find walking on stones or even salt meant to melt ice in the winter irritating. There are booties you can buy to protect their feet but you will have to train your dog to accept them which also takes a bit of time. Older dogs may refuse to walk because of joint pain. It is more common in large breed dogs but certainly possible for dogs of any size to be achy which would cause them to refuse to walk. If this is the case a trip to your Veterinarian is in order. 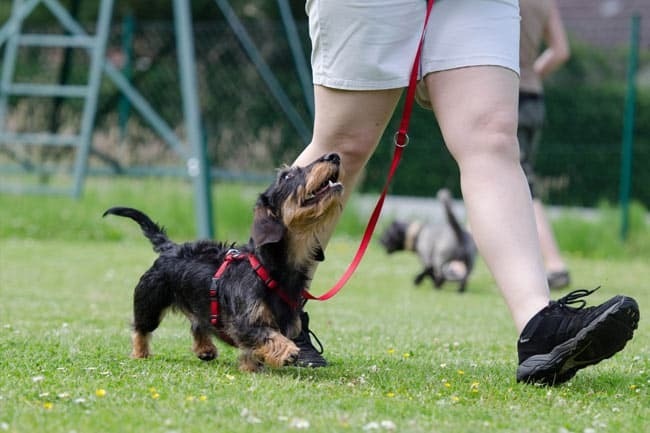 If your dog refuses to walk because you simply give them more attention when they misbehave then you need to brush up on your training skills. These 80 training tips https://chocolatelabradorretriever.ca/lab-puppy-training-tips may help in other areas, however understanding that any attention is a reward for your dog is important. For example, you leash your dog and head out and your dog sits still. Again the cement block! Does she think that if she sits there you will come back and talk to her trying to coax her? Even if your words are stern and of a negative nature, dogs can’t speak English, so all they hear when you scold them is Bark Bark! They see the scolding as attention and you end up reinforcing her sitting there and not moving by rewarding her with talk and/or touch. Along the lines of positive reinforcement you need to reward the behavior you want, and completely ignore the behavior you don’t want. This means no touching, talking to them or looking at them. If the collar you are using is contributing to your dog refusing to walk, get them a new one and be sure it is comfortable, wide enough, and has between 1 and 2 fingers play between your dog’s neck and collar. It needs to be tight enough to not slip off and lose enough to give them enough clearance to breathe and swallow. So, exactly what routine is best for a dog refusing to walk? First you need to be confident from the minute you approach your dog. If you show up with a tone in your voice that suggests you are asking your dog if they want to go for a walk, they will pick up on that right away. If you are using a training leash slide it over their head and adjust it so that it is high on the neck, close to under their jaw. At this point if they still don’t move you may need to bring out some reinforcements. Use a slice of lean lunch meat such as chicken or turkey. The reward needs to be amazing, not just the regular reward and put that in front of their nose so they can smell it. Be careful not to let them eat it because you will then be rewarding them for sitting there. This is definitely not good to do. But as soon as they move forward toward you, reward that behavior and keep going. You got a dog who refuses to walk to move! Save that moment for celebration after the walk is over, there is more work to do. You will want to keep them going being sure you don’t show them you are nervous by keeping constant tension on the leash. The full term for walking on leash is walking on loose leash but we often forget to say the loose part. A leash is only for safety and should be loose almost all of the time. If it’s not, you need to question who is walking whom. So that might do it, if not and your dog stops again or during your walk we need to explore one of the other possibilities for this happening. When they stop, don’t walk backward to them, rather give a slight tug and say “C’mon” again. If you need to offer another piece of the lunch meat be careful to only reward once they move. Again, don’t ask them to walk. Don’t negotiate. Give them the command to move and begin walking again. Sometimes if you walk in a circle around them it may help them to lose focus on what they were focused on and they might just follow you. A change in direction could also work. If this doesn’t work immediately please be patient. A dog who refuses to walk may not learn the instant you show them. Rather learning takes time, it takes many repetitions, it takes clear expectations, it takes consistent expectations and most of all it requires you to enjoy the learning experience. Show your dog you are having fun, convey that energy to them and work at making them want to follow you.